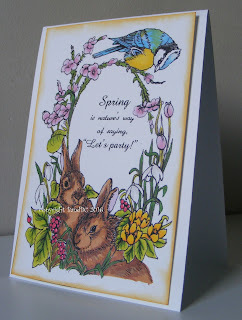 I was thrilled to get "Bunnies bird and flower border"
from Morgans Art Stamp Store. I loved colouring this image - and I popped a spring sentiment inside. I thought this could be used for a spring birthday card. on the back to make it stand off the page. OH MY WORD!!!! Not sure where I should start on this!! Just gorgeous!! Love all the elements and the beautifully colored card! Wonderful job of coloring on this sweet image! Beautifully crafted! Thanks so much for joining us at The Sisterhood’s ‘THINK SPRING’ challenge and please come back again soon! Hi Vic, this is a beautiful card, such a gorgeous image - I love how you have coloured this.. Thank you for joining us this time at The Paper Shelter. Beautiful. This would be also very nice for Easter. Thank you for joining our "Furry Friends" challenge at Wags 'n Whiskers and good luck in the draw. Such a great image for a spring card. Great sentiment to pair with this image.